In any country where there is a Bill of Rights, constitutional rights reasoning is an important part of the legal process. As more and more countries adopt Human Rights legislation and accede to international human rights agreements, and as the European Union introduces its own Bill of Rights, judges struggle to implement these rights consistently and sometimes the reasoning behind them is lost. Examining the practice in other jurisdictions can be a valuable guide. Robert Alexy's classic work, available now for the first time in English reconstructs the reasoning behind the jurisprudence of the German Basic Law and in doing so provides a theory of general application to all jurisdictions where judges wrestle with rights adjudication. 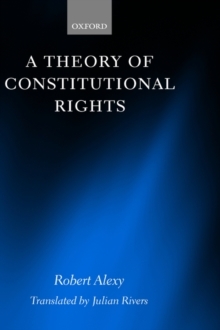 In considering the features of constitutional rights reasoning, the author moves from the doctrine of proportionality, procedural rights and the structure and scope of constitutional rights, to general rights of liberty and equality and the problem of horizontal effect. A new postscript written for the English edition considers critiques of the Theory since it first appeared in 1985, focusing in particular on the discretion left to legislatures and in an extended introduction the translatorargues that the theory may be used to clarify the nature of legal reasoning in the context of rights under the British Constitution. This book will be of central interest to all legal and constitutional theorists and human rights scholars.